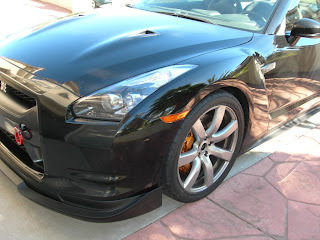 A GT-R owner, and track junkie, just posted some pictures of his R35 GT-R with a couple of upgrades. 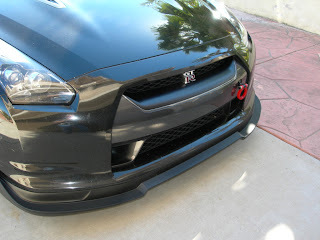 In addition to the STILLEN front lip spoiler and side skirts, he added a tow hook, and 285 mm wide tires to match the width of the rear tires. Why would you go with the rear sized 285 tires on the front of a GT-R? Ever hear the phrase wider is better? When we are talking about a car that carries 53 % of its weight on the front wheels, and it has a 255 mm wide tire, generally owners complain of understeer at the track, and tire wear at the front, going wider will help to alleviate a few of those complaints. 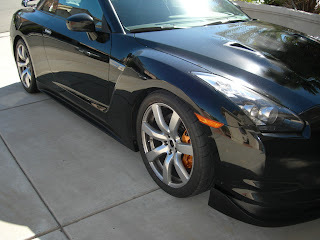 A stock GT-R does well on a road course, a few of the correct mods can make it even faster. Going with a 285 tire on the front also allows you to rotate the tires to even out the tire wear. The wheels are different sizes and offsets front to rear, but the tires can be dismounted and moved. The 2009-2011 Owners manuals discouraged this, but it is now allowed if inspected in the 2012 Owners manuals. The STILLEN front lip will give the owner a little more downforce at the front, and as a bonus, covers up some damage from GT-R $1500 OEM lip vs parking block. The STILLEN front lip is made from urethane, and is flexible enough to take some abuse.